Description: Traverse City is the gateway to the Sleeping Bear Dunes National Lakeshore and the deep blue tranquility offered by Lake Michigan. Capture the grandeur of nature with this new Sleeping Bear Dunes. The city and neighboring Northwest Lower Peninsula region of Michigan offer spectacular scenery and many ways to get out and enjoy that landscape. While the outdoor experiences in the park are spectacular and unforgettable, the cycling, canoeing and kayaking activities that take place in Traverse City and its surroundings are equally incredible. 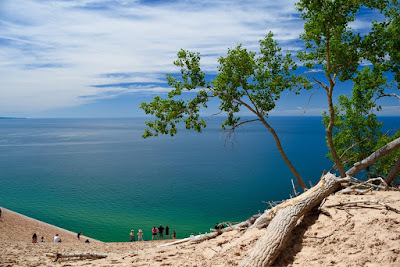 The magnificent views of Lake Michigan, the conservation of many extensive beaches, the islands covered with forests, the transparent lakes, and the varied wildlife make this place one of those special places that is worth experiencing for oneself. Viewers of the ABC television program "Good Morning America" ​​voted Sleeping Bear Dunes National Lakeshore (National Coast Sleeping Bear Dunes) as the "Most Beautiful Place in the United States" and with good reason. Whether you camp in a rural area, dive into the sandy bottoms or walk the 24 kilometers of the Platte Plains Trail, the Sleeping Bear Dunes National Lakeshore will captivate you. To the west, the Leelanau Peninsula (Leelanau Peninsula) also has a wine route that highlights the existence of 25 wineries. Cyclists can interrupt the trip in minicircuitos, which offers additional opportunities to pedal, drink and let yourself be delighted by the sun, and repeat the experience. Plan a stop at Sutton's Bay (24 kilometers north of the west side of Traverse City), a quaint town filled with galleries, shops and fascinating restaurants. The Old Mission Peninsula (peninsula Old Mission), located in the beautiful Grand Traverse Bay, which is famous for its grape's quality, as well as its impressive landscape. In addition to eight wineries, there are several fine dining options to taste dishes that complement well with the wines. From Traverse City, you can walk on one of several trails with panoramic views of Grand Traverse Bay, such as the Leelenau Trail along the Cherry Road and the Center Highway. Rent a kayak or a canoe and paddle to get picturesque views from the water.. With all the applause that the grapes receive, Traverse City is also a paradise for cherries. The acres of cherry trees line the bike paths, rivers, streams and lakes of the area and, in the spring, you will be so surprised that you will think that the pink flowers are electric. You can also rent a paddle board and join participants to do yoga in the bay, or you can plan a fishing trip and discover Boating Magazine designated Traverse City as one of the best place to boat"